Telecom Cook Islands Ltd trading as Bluesky Cook Islands introduced to customers the new logo and visual identity. 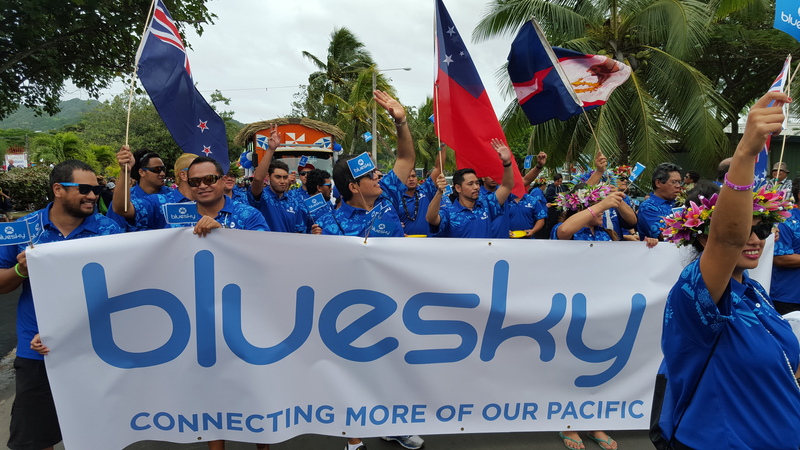 Bluesky launched the Bluesky brand in the Cook Islands on the 23rdOUR our of July, 2015. Teleraro Limited, a consortium, led by the Bluesky Group, purchased a 60% interest in Telecom Cook Islands Limited from Spark New Zealand in February 2015. The consortium includes a Trust which holds 10% of the Teleraro shares on behalf of participating employees in the Cook Islands. It also includes a Trust to hold 15% of the shares of Teleraro for Cook Islanders to purchase. This is the first time that the people of the Cook Islands have been given the opportunity to directly participate in the ownership of the company. Since February 2015 Bluesky has worked closely with the leadership team from Telecom Cook Islands, blending the considerable talents and technology of the companies. Along with a new look under the Bluesky brand, the Cook Islands community will see the introduction of new and exciting products and promotions that will allow residents to enjoy being connected anytime and anywhere, to each other and the wider world beyond. Bluesky's product range offers core telecommunication services of fixed-line, mobile, internet, postal and Moana TV (IPTV). Products for the home and individual users as well as corporate solutions to corporate clients (PABX, dedicated lines), international and national (long distance) calling services, prepaid calling cards, wifi/hotspots, e-charges services, mobile products and accessories. To achieve this we aim to have a workforce that is skilled and knowledgeable about all aspects of telecommunications and that is focused on meeting the everyday needs of our customers. In return, our staff enjoy a range of benefits as well as the opportunity to be supported to obtain experience and qualifications in their chosen field of expertise.